Michael Nachman and the members of his lab study population, evolutionary, and ecological genetics and genomics. Most work is on mammals with particular emphasis on mice and humans. We are broadly interested in the genetic basis of evolutionary change, including the genetics of adaptation and the genetic basis of speciation. For example, we are interested in uncovering signatures of selection in patterns of DNA sequence variation across the genome and in linking specific genetic changes to specific adaptive phenotypes. We are also interested in the genetic basis of reproductive isolation between populations and closely related species that hybridize in nature. Our research utilizes a wide range of methods and approaches including field studies, genetic crosses in the laboratory, tools of molecular biology, genomics, and bioinformatics analyses of large datasets. Phifer-Rixey, M., Bi, K., Ferris, K.G., Sheehan, M.J., Lin, D., Mack, K.L., Keeble S.M., Suzuki, T.A., Good, J.M., Nachman M.W. 2018. The genomic basis of environmental adaptation in house mice. PLoS Genet. 14:e1007672. Mack, K.L., Ballinger, M.A., Phifer-Rixey, M. and Nachman, M.W. 2018. Gene regulation underlies environmental adaptation in house mice. Genome research, gr-238998. Mack, K. L., and Nachman, M. W. 2017. Gene Regulation and Speciation. Trends in Genetics, 33:68-80. ​Suzuki, T.A., and Nachman, M.W. 2015. 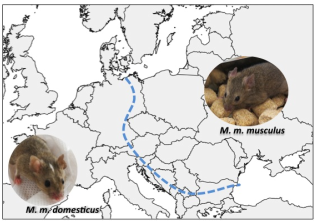 Speciation and hybrid female fertility in house mice. Evolution, 69(9):2468-2481. Phifer-Rixey, M., Bomhoff, M., & Nachman, M. W. 2014. Genome-Wide Patterns of Differentiation Among House Mouse Subspecies. Genetics, 198:283-297.